Ahead of its global debut at the Geneva Motor Show, Mercedes has released details on their AMG E63. Promising eye-watering speed of 0-62mph in 3.5sec in its range-topping S 4Matic+ guise, the E63 estate will be also be available in a lower-spec E63 4Matic+ model. The two variants offer torque figures of 750Nm and 850Nm respectively, and in terms of performance these estate versions are only a tenth of a second slower to 62mph than their saloon equivalents. With 4.0-litre twin-turbo V8 engines under the bonnet – producing 563bhp in the standard E 63 and 604bhp in the ‘S’ badged car – the E 63 Estate is not only more powerful than its predecessor but it’s more efficient too, managing a claimed 31mpg. This comes as a result of downsizing and cylinder deactivation technology. Both cars come with 9-speed dual-clutch automatic gearbox as well as 4matic+ all-wheel-drive and are electronically bound to a 155mph top speed. If you need more, the AMG Driver’s package removes the limiter and can reach a top speed of 180mph. 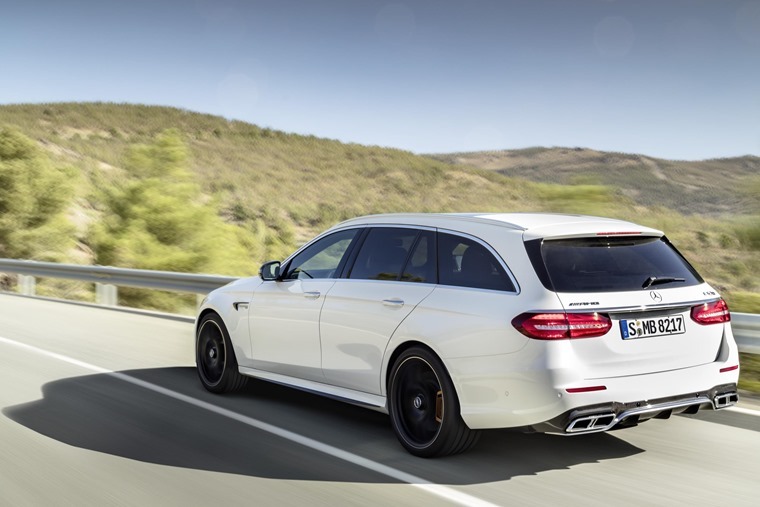 As is to be expected with an estate car, the E63 comes with a huge 640-litres of boot space, rising to 1,820-litres if the rear is folded flat. 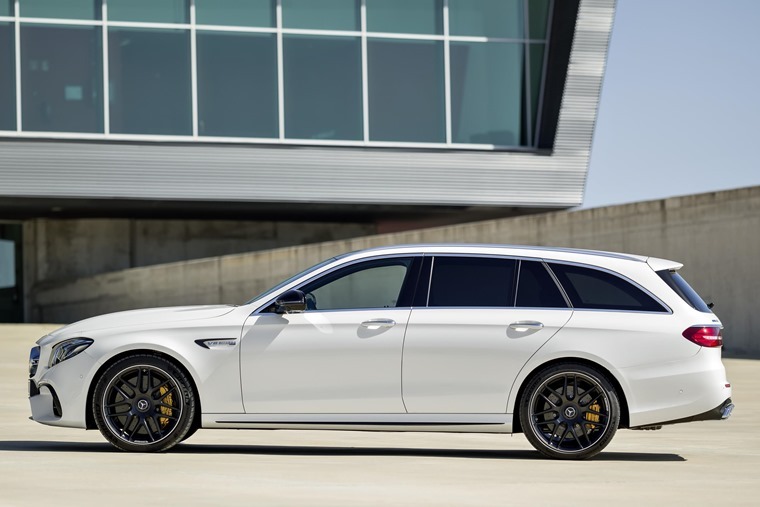 The AMG bodykit increases the width of the E63 Estate by around 27mm than the standard car, with the flared wheel-arches being necessary to contain the wider track, while the aprons and side sills are intended to make the Estate look low on the road and are inspired by jet wings. This styling will also mean more agile handling on country roads and optimum driving stability at high speed on the motorway. 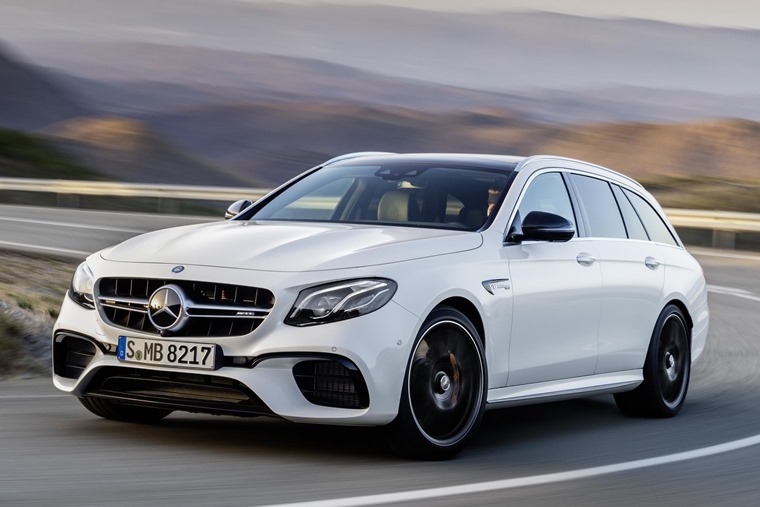 On top of this the AMG E63 offers a new air suspension system, semi-autonomous driving features, plus performance seats and an AMG steering wheel. Deliveries are expected to begin August. Leasing prices will be available soon.